Whenever authenticity translates into money, you can be sure someone is out there to cut corners and take advantage of naive or inexperienced buyers. The rare collectible market has been increasingly fraught with fakes and misrepresented items over the past several decades. The level of sophistication in faking or altering a fossil or antiquity to artificially increase its value, has become so advanced that buyers need to use discernment and caution. Only highly experienced suppliers who possess necessary equipment AND who are actively working with all techniques of fossil and artifact preparation, restoration and fabrication, should be trusted to know the difference when it comes to fake or altered items. SIMPLY PUT, IF YOU DO NOT KNOW HOW A SPECIMEN CAN BE FAKED, ALTERED OR ENHANCED, YOU WILL BE CLUELESS WHEN IT COMES TO DETECTING IT. Ask your supplier about his or her PERSONAL experience in a preparation / conservation lab. The BEST scenario is the supplier you are dealing with operates their own lab on the premises, as we do, and does their own work on what they are selling. If they tell you they do not PERSONALLY operate their own lab or possess EXTENSIVE experience in this field, and they rely on THEIR sources, avoid these dealers at all costs! These individuals most probably have specimens in their inventory that are problematic, regardless of any guarantee or assurances that they will provide you. AN HONEST BUT UNINFORMED DEALER IS NO DIFFERENT THAN A DISHONEST DEALER. The end result is the same to you - you may not receive what you thought you were buying. 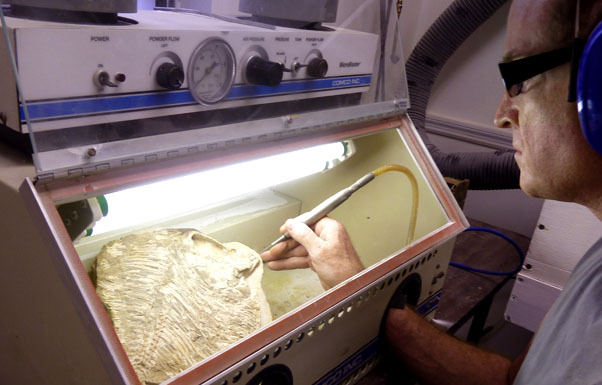 All our staff are fully experienced and actively employed in fossil and artifact conservation, preparation, repair and restoration. We operate a fully-equipped 3200 square foot lab facility on-site, to prepare and conserve our diverse inventory of fossils and artifacts we offer for sale. Fakes are sometimes easy to spot. Other times, they are nearly impossible without special equipment, regardless of experience. Microscopic examination with a 10-30x power binocular microscope is usually sufficient provided you know what you are looking for. There are times though, that more is required. In the past 20 years, we have seen so many forgeries and misrepresented items, it is disheartening. Many were in collections unknown to their owners for decades or even generations. Many were extremely expensive! Over the past two decades, there have been three incidences where we received a bad item that was misrepresented but passed our visual inspection. It was only during the lab cleaning process that we discovered each item was altered with restoration but not disclosed. Interestingly enough, all these pieces were acquired from extremely reputable sources but THEY lacked a lab or related equipment so they were essentially "blind", as most are. It was only discovered by OUR lab microblaster during a cleaning ritual we run everything through, prior to offering for sale. How many other dealers do this or have the capability? The answer is almost none! They say the most convincing lie is one that is part true. This is also the case with altered fossils and artifacts. This is the type of bad piece that is most often overlooked because the real portion(s) cause one to "drop their guard. An example of this is an ancient sword made out of a much less valuable genuine spear, and additional genuine and modern parts are added to imitate a very expensive sword. Another example would be a very large dinosaur tooth or claw that is actually made up of parts from multiple genuine specimens. A VERY common example in this category and most often seen being sold from both unscrupulous and scrupulous dealers alike, are fossils or artifacts that have much more restoration and repair than is disclosed. There are a MANY tricks and substances to use that will fool UV light inspections and even X-ray inspections. Lab cleaning equipment and processes will detect these types of fraud but again, most dealers do not have access to this equipment or know what to look for. Another commonly seen problem is one where a fossil or stone tool artifact, is incorrectly identified. Sometimes, this is out of ignorance and sometimes, it is out of outright malice. There are many "nice guys and gals" in the business that just do not know what they are dealing in. We have seen fossil turtle claws (virtually worthless) being sold as "raptor" dromaeosaur dinosaur claws. A common misnomer in dinosaur teeth is selling Carcharodontosaurus dinosaur teeth as "African T. rex" teeth. This is done to fool buyers into thinking they are getting a GREAT PRICE on a genuine T. rex tooth and no big deal, it's from Africa. The truth is you are NOT getting a T. rex tooth. Tyrannosaurus rex NEVER lived in Africa, nor was alive anywhere on the planet when Carcharodontosaurus was alive! It would be like saying "a Chinese Harley Davidson motorcycle". No such thing. Regarding genuine prehistoric and neolithic stone tools and artifacts, this is where correct identification is EVERYTHING! Are you buying an ordinary, worthless rock that's being sold as a $5000 Neanderthal Mousterian hand axe? Is a dealer offering an African Neolithic scraper worth $5 as a much older Acheulian hand axe for $200? Without question, the collectible market where we have seen the most ignorance and misidentification is that of prehistoric and neolithic stone tools. The good news in this field is that there are numerous excellent books to learn how to tell altered and fake artifacts. There are also several reputable third-party artifact authenticators you can have examine your prehistoric stone tool purchases. The bad news is that this is a field that requires MUCH more knowledge than selling fossils, and the dealer ignorance in this field is staggering. Buyers MUST get everything guaranteed forever, in writing, and learn as much as they can by buying reference books that show what a genuine specimen looks like, and books that demonstrate how to tell fakes or altered objects from original, untouched specimens. Many of the techniques used today to forge and fabricate items, have become so sophisticated that without current and continual experience, it becomes dangerous "guesswork". Many dealers have been sold forgeries by their suppliers who they thought were "trustworthy" only to find out the truth at the expense of their customers and their reputation. Stay away from resellers (those that buy their items in the same condition that they sell them in), and stick with a professional company that operates a lab and does their own work, if you want peace of mind beyond the guarantee. With all purchases, make sure you get in writing and issued by the dealer you are buying from, a WRITTEN GUARANTEE OF CONDITION (what's been done to it), IDENTIFICATION AND AUTHENTICITY, that has no conditions or expiration time. As the collector, your best defense will come with time - EXPERIENCE AND EDUCATION. Learn all you can about what you collect, why it is rare, what makes it rare, what it looks like, how to spot fakes or restoration and what is the proper identification of different specimens. Remember, in the realm of collecting, KNOWLEDGE IS POWER. Besides, you will gain enlightenment and a far greater appreciation your collection if you know all about it. Where there are specific issues to look for with certain types of specimens we offer, we try to point out in the individual listing or page on this website. We will be happy to help answer any questions on this topic BUT.... we will NOT point out bad dealers, bad material offered or sold elsewhere, or appraise or identify your fossils for you. If in doubt, the best unbiased advice you can seek for a second opinion is to ask a paleontologist or related scientist affiliated with a local museum. Some will be happy to help. Another valuable source is a professor within a university geology, biology or ideally, paleontology department. While they may not be fully aware of techniques for faking fossils, they WILL know what the real specimen should look like or what it may be if identification is an issue.